Having lain at moorings in the Holy Loch for a number of years, the 1958-built tug ST BUDOC moved alongside the pontoons at the Holy Loch Marina today, where she towers over some of the yachts berthed there. This tug was built as FOYLEMORE at the WJ Yarwood shipyard at Northwich, in Cheshire, for Johnston Warren Lines who used her on the Mersey. In 1969, she was acquired by the Rea Towing Co Ltd, who renamed her FOYLEGARTH. A further change of name and owner came in 1983, when she was sold to Falmouth Towage Ltd, joining their fleet and taking her current name. Her overall length is 103ft 6in, and her gross tonnage is 208 tons. A 7-cylinder Ruston & Hornsby engine gave her a bollard pull of 24 tons. 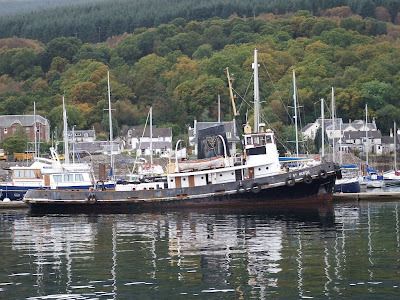 In 2002, she was sold to Salvage International, a Plymouth-based company and she arrived on the Holy Loch in August that year following a transfer to Western Marine Salvage Ltd. Since then, she has occupied moorings at the west end of the loch apart from a short spell when she carried out one towing job. ST BUDOC has recently been the subject of a dispute with Clydeport Operations Ltd over the matter of unpaid harbour dues. It is believed that her move today was to allow inspection by a prospective buyer. Hi John,great site,well impressed,its very informative and interesting.Will try to catch up with you soon John.Im on the Phantom this week then on the Mallaig next week.